Near to many leading family-friendly attractions, huge shopping centers (at Greensburg and Grove City) and wonderful American cities, day trips from Pittsburgh are almost obligatory, particularly if you have your own set of wheels. 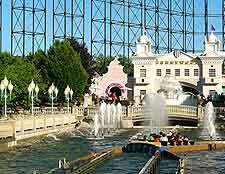 Particularly close to Pittsburgh are the attractions within the historical Kennywood Amusement Park. Established as far back as 1898, the Kennywood Amusement Park has long been one of the main family attractions in the Pittsburgh area and this historical theme park is now listed as a National Landmark. Both the Fun Fore All theme park and the Seven Springs Mountain Resort are also nearby, along with the Ohiopyle Park, while further afield are the cities of Canton (Ohio), Cleveland (Ohio) and Columbus (Ohio). Even Detroit (Michigan), Philadelphia and Washington (DC) are only just over four hours away. 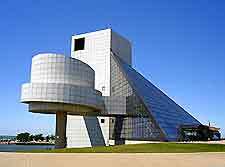 In recent years, the city of Cleveland has started to enjoy a significant tourism industry and contains many fun attractions and impressive landmarks. Cleveland is to be found around 133 miles / 214 km to the northwest of Pittsburgh and can be reached in just over two hours. Always popular is the Cleveland Metroparks Zoo on Wildlife Way, the Great Lakes Science Center off Erieside Avenue, and the Rockefeller Park, where the famed City of Cleveland Greenhouse is located. Also of note is the Terminal Tower, a historical skyscraper easily visible from the skyline. Both the Rock and Roll Hall of Fame and Museum at One Key Plaza, and the Cleveland Museum of Natural History on the Wade Oval Drive are quite unmissable, particularly is you are here with children. Fun Fore All is sited around one hour's drive from Pittsburgh and lies on the city's northerly outskirts, in the neighboring Cranberry Township. The main attractions include everything from go-karts and bumper boats, to arcade games, miniature golf, mini-tea cup rides and a soft-play area for younger children under 12 years old. Little Leaguers visiting Fun Fore All and in need of some baseball practice have a choice of nine batting cages to practice their swing. All ages will discover a fun day out at the Kennywood Amusement Park, with traditional fairground attractions, fast state-of-the-art rides and many exciting roller coasters. A firm favorite is the Phantom's Revenge, which is amongst the world's very fastest roller coasters. You can also expect to find a series of water rides, such as the Log jammer and the Raging Rapids. Also at the Kennywood Amusement Park is plenty of live entertainment and shows, including the Fred Scheer's Lumberjack Show. Dining is readily available around the park, with over 30 different refreshment stands on hand, along with the popular Parkside Café. The American city of Canton is situated around 91 miles / 147 km to the west of Pittsburgh and is just about close enough to make a day trip possible, particularly if you are prepared for an early start. 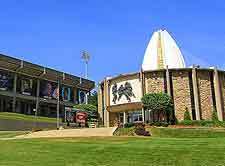 There is plenty to do within Canton, with the Pro Football Hall of Fame on George Halas Drive standing out from the crowd and being home to the biggest collection of pro-football memorabilia is the whole of the USA. Canton is very much a city of the performing arts, with the Cultural Center for the Arts and the Canton Museum of Art being especially notable, along with the restored 1920's Palace Theater. Columbus, Ohio may be just over three hours away be car, but it really is worth considering for a short break excursion or similar, due to its relative proximity. Actually around 185 miles / 298 km to the west, Columbus is well known for its family orientated attractions, such as the Magic Mountain Fun Center on the Scarborough Boulevard, and also the Columbus Zoo and Aquarium on the Riverside Drive. The Ohio State University is located here and adds a definite youthful vibe to the city itself, while other important sights of interest include the Ohio Statehouse, the McKinley Memorial and the Center of Science and History (COSI) and the Harley-Davidson Museum. 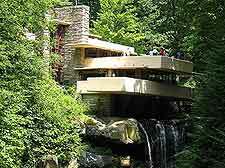 The Frank Lloyd Wright masterpieces are one attraction not to miss and lie on the northerly outskirts of the Ohiopyle Park, some 50 miles / 80 km to the southeast if Pittsburgh and within the Stewart Township. The acclaimed Fallingwater house enjoys a fairly remote and quite setting, and also goes by the name of the Edgar J. Kaufmann Senior Residence. Built in 1935 and designed by modern American architect Frank Lloyd Wright, the Fallingwater house sits atop a cascading waterfall and boasts characteristic strong vertical and horizontal lines. Another related Frank Lloyd Wright attraction close by is the Kentuck Knob (Hagan House), a less visited house built into a hillside in the early 1950s. Both of these structures are now listed as US National Historic Landmarks. Ohiopyle Park is close to the city of Pittsburgh and covers an area of over 19,000 acres / 7,690 hectares. This truly beautiful state park offers visitors an array of recreational attractions, with the white-water rafting on its Youghiogheny River being a particular favorite for many a visitor. 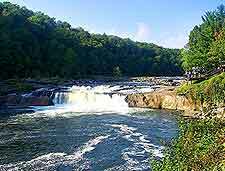 The Ohiopyle Park is also home to a number of scenic hiking and cycling trails, together with opportunities to enjoy some great fishing, canoeing and horseback riding, particularly around the central riverfront village of Ohiopyle. In the summer months, crowds flock to the Ohiopyle Park for its fun natural water-slides alone. 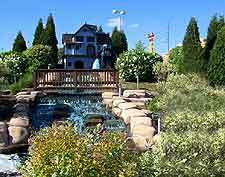 Seven Springs lies around 40 miles / 64 km to the east of downtown Pittsburgh and offers its very own selection of seasonal attractions. The Seven Springs Mountain Resort serves as the main draw card and this all-season resort features summer hiking, fishing and golf, while during the snowy winters, cross-country skiing and snowboarding are popular. Skiing at Seven Springs begins as early as the start of December and lasts right through to early April, provided that enough snow has fallen during this period.